Going to be another slow week at work, so I am planning on being at the railroad 2 days TBD this week. Hopefully one day on the bridge, one day tamping. I am also hoping to be there on Friday or Saturday to do some of my leaderless jobs that really need to get done, along with hopefully more brush cutting. Piles were arranged and loaded at Sheepscot in preperation for use later this week. The remaining bridge stringers were drilled and bolted together. Hiking trail relocated next to the roadbed near Trout Brook bridge and construction site. Survey crew was working with the contractor at the bridge site. They noted how incredibly friendly we are towards each other, and how much work we get done. Along with all of that, volunteers also entertained guests for a chartered train ride, and a family was also given a presidential tour. A lot happened today in the extreme heat. * Annual Picnic! I believe that Nancy Weeks is doing the food. We're getting a visit from a World War 1 re-enactor group (the same group as last year), this time they have more stuff. * Operations: Full sized first and second class trains. Plus I think there's a photo event Saturday evening. * Mountain Extension: Mike is planning to place cement blocks for retaining wall. The four corners that the bridge sits on were bolted together. Took the day to complete, and may not seem like much, but they are 3 wood blocks, each one weighs around 300 lbs or more and to drill through all three the top block on each one had to be removed to finish drilling the last two. Then pounding the long bolts through was another chore in itself. 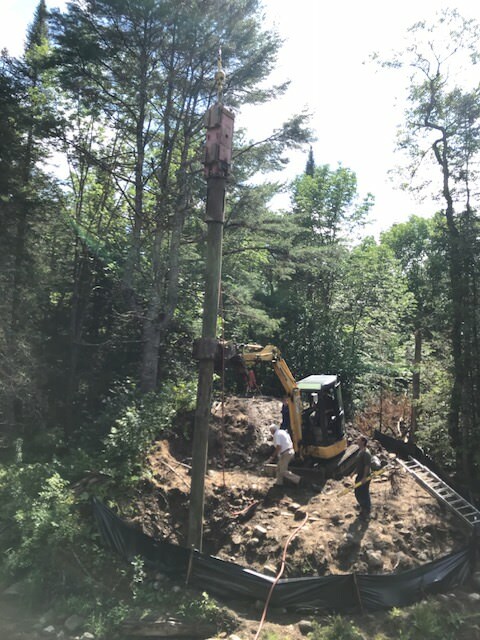 Piles were sorted and loaded at Sheepscot in preperation for the contractor. Work went on at the bridge site to prep for the piles, including the contractor rigging the crane up for setting piles. Grass was mowed at Alna Center to be ready for this weekend. Sheepscot was a very busy place yesterday, and if something happened that was not mentioned its not intentional. I'm surprised the drilling and bolting of the four corners for the bridge has been completed. From the looks of them when we stacked them I thought it would take much longer to drill, move, drill, restack and drive the bolts through. I started working on them at 7:30 in the morning, by 9 we had a 3-4 man crew moving them around. Needless to say we were all very happy when the last bolt was in. The first pile was driven today inspite of the mid afternoon rain. What really helped was Joe on the drill (younger and stronger) and the new more expensive drill bit. It helps to pay for the best! We were wet and busy. I got a couple, one of which mike just posted on the bridge thread. I believe Dave B got some. I got video but don’t know how to send such a large file from my phone. I sent mine to Stewart to post. I also sent to HWMNBN. Perhaps one of them can post here. Your video should go to our Youtube account. He volunteered me again! I need to change my name. You love and you know it. Thanks my friend.